Saatva is an innovative direct-to-consumer company that specializes in luxury innerspring mattresses. 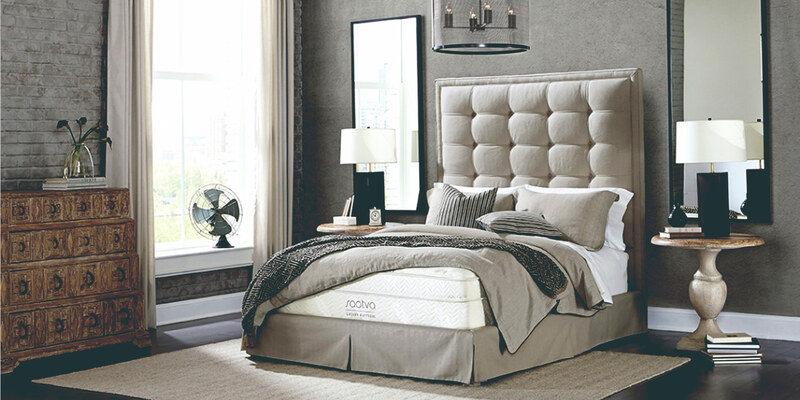 Their unique manufacturing and sales process allows them to offer prices that are commonly 50% less than comparable luxury mattresses, and even tack on free delivery! This mattress brand really gets what being people are looking for, and have been delivering quality comfort while getting rave reviews. Saatva makes luxury mattresses that are made in America and sold directly to people through their website with no crazy markups or middlemen involved. They make some of the best mattresses on the market and are renowned for their use of high quality materials like organic cotton. This new direct-to-consumer mattress business model has been popularized in recent years by mattress brands such as Casper, Tuft & Needle, and Bear. These companies specialize in foam mattresses that are easily rolled into a small box that makes it easy to ship, and easy to manage—but not Saatva! 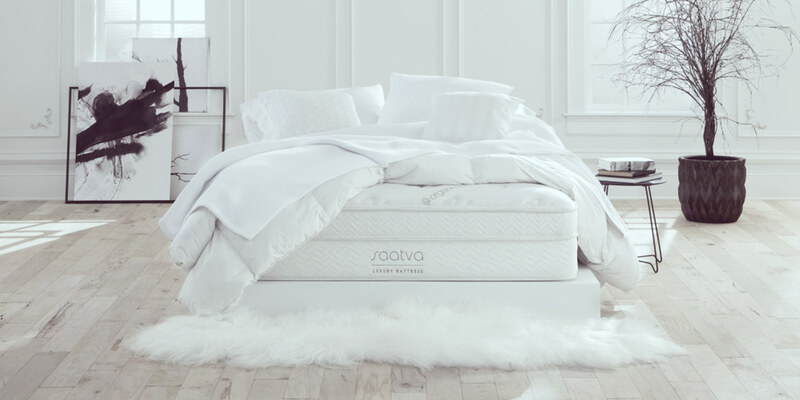 Saatva takes a different approach—building their mattresses from more traditional springs and featuring luxurious quilted tops made of Organic Cotton blends. They are one of the only companies offering this type of direct mattress sales, and are undercutting store brands price by nearly 50%! They offer a wide range of comfort levels to cater to almost all sleeping types, and are committed to an eco-friendly manufacturing process that sets a new standard for socially and environmentally-conscious brands. Saatva Mattresses are made of Organic cotton and elegant stitching. Image from Saatva. Saatva operates under a simple philosophy of providing the lowest prices year round without the use of coupons, seasonal sales, or other seemingly random offers. Stores like Mattress Firm or Sleepys are notorious for offering weekend sales, holiday sales, and other nonsensical promotions that do little more than illustrate how high their margins really are. Saatva believes that if you want to buy from them, you should have access to the lowest price no matter what. They have invested heavily in US-based manufacturing and direct sales to consumers to help eliminate the need for middlemen that jack up the prices for no reason other than to pad their wallets. Buying a mattress from Saatva is a perfect illustration of how completely the internet has changed the way we shop, and also how much money it’s capable of saving us. Many of the newer mattress brands that offer direct-to-consumer sales like Saatva specialize in foam only mattresses. Saatva offers more traditionally-designed coiled springs in their design—although they’ve completely re-imagined what a coil spring mattress can be. Saatva mattresses have two layers of springs, which they believe provides a sag-proof sleeping experience. The first layer, closest to the top, is made of springs that are individually-wrapped in soft comforting materials to lessen any potential pressure point issues. Above this rests a layer of memory foam, which is finally topped off by their Organic Cotton pillow top. Saatva’s unique approach in blending traditional mattress springs in an innovative new way, combined with their performance foam tops coalesce for a superior sleeping experience. Many direct-to-consumer mattress companies offer a single comfort level—usually somewhere in the mid range of softness. This is to help their single product meet the demands of the most people. This is a great approach for keeping down operating costs, but ultimately offers consumers less options. For instance, if you absolutely love the feeling of being encased by the cloudlike experience of soft, plush, pillow-top mattresses—you wouldn’t likely be satisfied with an all-foam 10″ mattress. These types of products sold by companies like Casper, Tuft & Needle, and Bear are all great products—have no doubt—they just don’t offer a wide range in comfort levels. Saatva mattresses are offered in three different types of comfort levels. They offer a plush soft pillowtop-esque mattress that is meant to offer a much softer experience. This would be comparable to a 3/10 on a firmness scale. Their most popular design is the Saatva Luxury Firm Mattress which offers a firmer more supportive feel, but also some softness on the pillow top. This mattress is regarded as the best of both worlds by many, and could be considered as a 6/10 on a firmness scale. The third option offered is the Saatva Firm mattress, which is designed for those that like firm support, but still want to feel as if they are resting on something soft. This mattress could be considered as an 8/10 on a firmness scale, and is recommended for those who enjoy sleeping on their backs and stomachs. Saatva Mattresses come in the most popular sizes ranging from Twin to to California King. The only thing to pay attention to are the different thicknesses offered. For each mattress that Saatva sells, they offer two different thickness options—a 14-1/2″ or 11-1/2″ option. This is to provide a low-profile option if you have platform beds or simply want a shorter overall bed. Each mattress feels the same and responds to weight the same, and the only difference is in the height on the bottom set of springs. To make the 11-1/2″ thick mattresses, Saatva simply makes the bottom springs a little bit shorter! Below, you’ll find a Saatva Mattress size chart to easily compare the differences between each different design. Saatva mattresses are only for sale directly through the official Saatva website. The unique approach of selling directly to consumers rather than through third party retailers allows Saatva to offer a truly remarkable product at low prices. There are no markups, and no hidden fees. Saatva currently operates three distinct brands in addition to their unique sizing. Their other brands include Loom & Leaf and ZenHaven—each offering a specialized approach such as ZenHaven’s all eco friendly and natural latex at prices under $2000. Saatva mattresses are all covered by a risk free, 120 night trial during which time you are free to return you mattress free of charge. This return policy stems from the philosophy that there is no way to gauge the comfort of a mattress by laying on it for a few minutes in a store. You need to sleep on your mattress—a lot—to really know how comfortable it will be. Saatva mattresses are different than most purely foam direct sales mattresses in they can’t be rolled up into a tiny box and shipped via UPS. Saatva understands how important it is to get your products safely and conveniently, and have a powerful delivery network that helps deliver their products. Their delivery fee is typically $99, and includes a scheduled time and their ‘expert’ setup. They recommend allowing 9+ days for your delivery to be complete, which is a bit longer than other direct-sales companies. You can get a full run-down on what to expect with Saatva’s delivery program by reading through their Delivery Day webpage. They have been known to be very flexible and understanding of all the things that could go wrong during delivery and take extra care to ensure your experience is the best possible. After all, if ordering their products were a hassle—they’d likely be out of business quick! 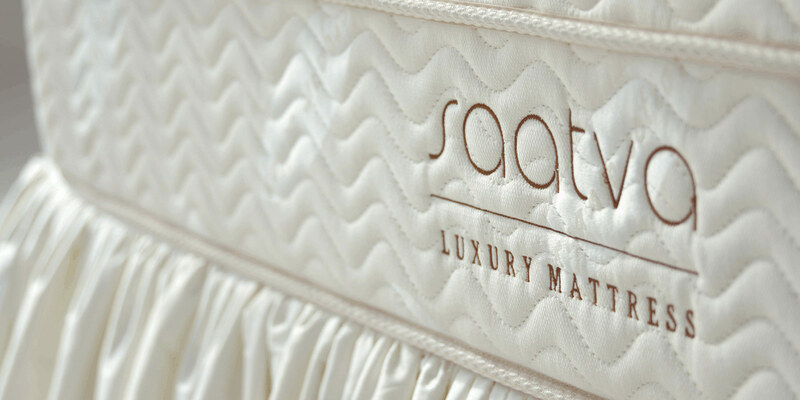 Saatva is an incredible company offering truly luxury mattress at nearly 50% less than typical retail mattresses. Their direct-to-consumer sales model helps keep people happy and coming back for more. Their innovative dual innerspring system offers a the best performance possible by individually-wrapping the top layer with comfort assuring materials. Their plush pillow tops and versatile selection of firmness helps Saatva offer a mattress suitable for nearly every sleep type. Saatva has become a revered brand within the mattress industry, and their market share seems to be steadily increasing. If you are looking for a luxury mattress without a luxury price tag—Saatva fits the bill. You’ll be hard presses to find any innerspring mattresses of similar luxury quality offered in the same price range in stores. Gone are the days of being exploited by local salesmen; replaced more everyday by internet saavy brands like Saatva—taking their share of the market and earning buyer trust. A Saatva mattress is a unique blend of comfortable and performing foam layers surrounding a dual innerspring system. Saatva offers luxury mattresses for direct purchase to help save tons on price compared to retail brands. Their unique approach and quality service make them one of the best mattress brands on the market today.